Wow that is incredible! I used to love buttered jerky. 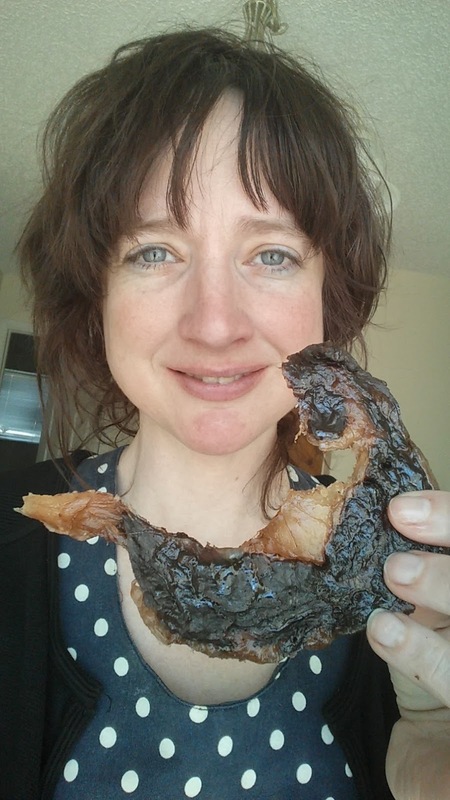 Hi Amber, so the jerky dries out the protein part, but I imagine the fat must still be somewhat soft. Is that right? And do you season it at all? 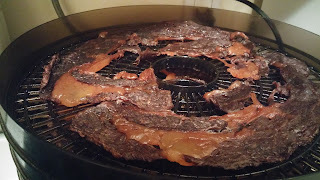 Does the fat drip and make a mess in your dehydrator? Yes, the fat stays pretty soft; melts in the mouth. It does drip a little bit in the dehydrator, but I wouldn't say it's a mess. It's easy to wipe off. I don't season it at all. These photos are after a day and a half, but it was already fantastic a couple of hours in, still basically raw. How thin is thin? I may have to ask the butcher to slice the meat for me as I haven't noticed anything thinly sliced. Do you know what could cause dry mouth in someone going into ketosis? Each time I try to do zero carb, even with cutting out plants, I always get extremely uncomfortable dry mouth and throat. It's so bad it keeps me up at night and it's not because I'm not drinking enough water. I don't have diabetes so I know it's not that either. I don't feel like I'm lacking in electrolytes. Please, help! If you want to have a real discussion about why you think that paper would be relevant given all the other evidence, I'd be happy to. I don't however feel much need to respond to a one line pointer to a study that I don't find compelling. I think, in fact, I've discussed it elsewhere on the net, though I don't have a link at my disposal. Thank you for your answer. Will try figure out the truth. Is it true that there is no any research of long term (>2 years) keto diet consequences? The fact is, low carb diets are the most effective treatment there is for diabetes. Moreover, all of the cultures in the past, even the recent past, who ate this diet didn't suffer from diabetes. Are you guys ever going to post again? Or is this going to be a "zombie" blog? By "you guys", I assume you mean me. Seriously, you try excelling at a full-time data science / programming job, single parenting half the time, and writing a blog! Here's what I spent the last few weeks on: My AHS16 talk on the evolution of the brain and weaning infants onto meat. I'll be posting a transcript and notes later. I didn't know the dynamics of your personal situation. I just enjoy your blog and often find that blogs that I like stop publishing. I will watch your talk later on Youtube and look forward to anything you have time to write. Oh, no worries, Pete. I am actually delighted that you expressed interest. What are your favourite topics here? I am fascinated by a total carnivorous diet, yet I find high fat something that bothers my whole gastrointestinal system. I plan to give it another try in the fall when I move into my new place. Not sure that the diet is for everyone. It might be something you need to play around with. I've found that I can't handle much chicken fat at all - it makes me sick. For other fats it depends on the composition of the meal - sometimes I can handle a lot, other times not so much. I'd still like to know how thin the rib eye should be. Local store cuts it fairly thick. Beef jerky tends to work best cut at 1/4" for something as fatty as Ribeye because it's less likely to fall apart at this thickness. You probably already go your answer though. I've been totally carnivorous for the past 3 months (after a decade of very low carb), and I am thriving on this way of eating. However, when I was low-carb, I'd read that it's best to have a high carb DAY about every 6-8 weeks. I don't know whether that's true, but I did it and didn't 'notice' any effects, positive or negative. Now I'm wondering again whether it would be good to have such a day. Your thoughts on this? I don't know of any compelling evidence that this is beneficial. Ronco convection only. It's inexpensive and quiet. How thin does the ribeye need to be sliced? What a great idea for an easy snack when away from home (like at work, or on long drives). Good question! This was done at the store, and I'm not sure what the measure was. I read a comment regarding long term Ketogenesis. I realize that the following is only anecdotal evidence but my Dad (M.D.) used a keto diet to help reduce the frequency and severity of epileptic grand mal seizures. His patients were using a keto diet literally for decades. He told me that his father (M.D.) used a very high fat moderate protein very low carb diet to treat his epileptic patients too. My grandfather died in the early 1930's when drugs for epilepsy did not exist. 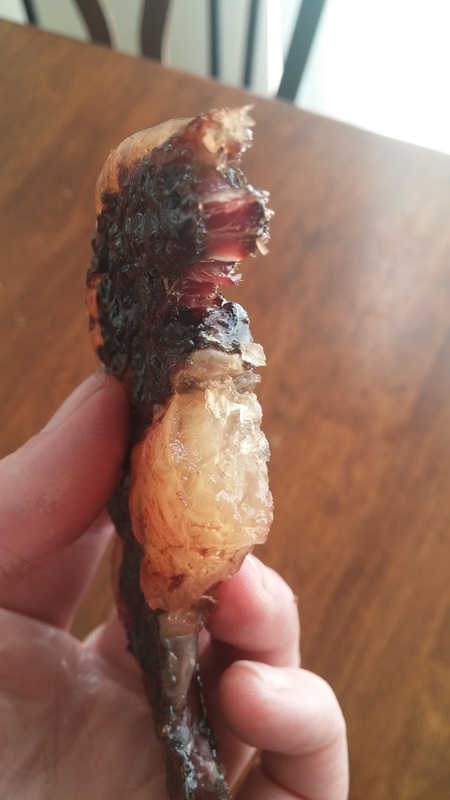 I make my jerky from beef belly. It lind of looks like dark brown bacon. I love raw beef. I would also point out that duck breast makes really tasty jerky too. I am intrigued with the idea of ribeye jerky. I make gizzard sausage that is extremely fatty. After cooking the gizzard to falling apart doneness I mix in an equal portion of bacon fat. After it is chilled to firmness it can be sliced like a cold cut. Very tasty. 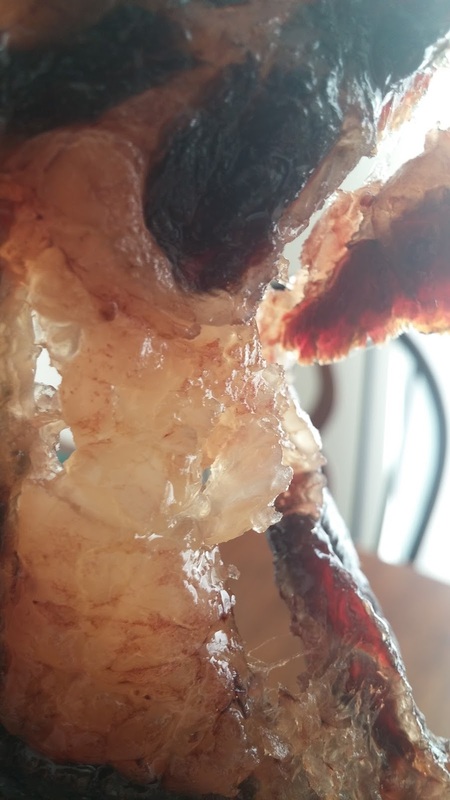 I made a lot of Venison jerky when we got a young 5-point buck this past hunting season. 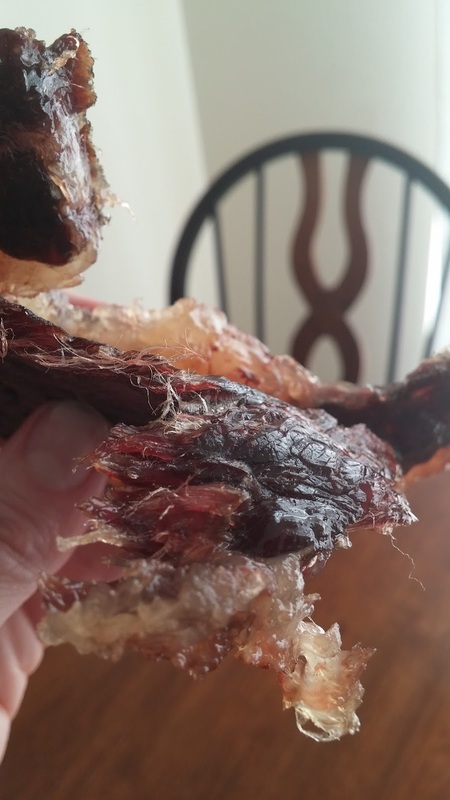 I found jerky recipes that did not have any sugar in them to season it. I used a Cuisinart dehydrator. It was a bit time consuming to slice all that meat, but it was worth it. I probably ate almost all of it myself and I made POUNDS of it. Since it was very low in fat (venison is quite lean), I usually paired it with cheese. 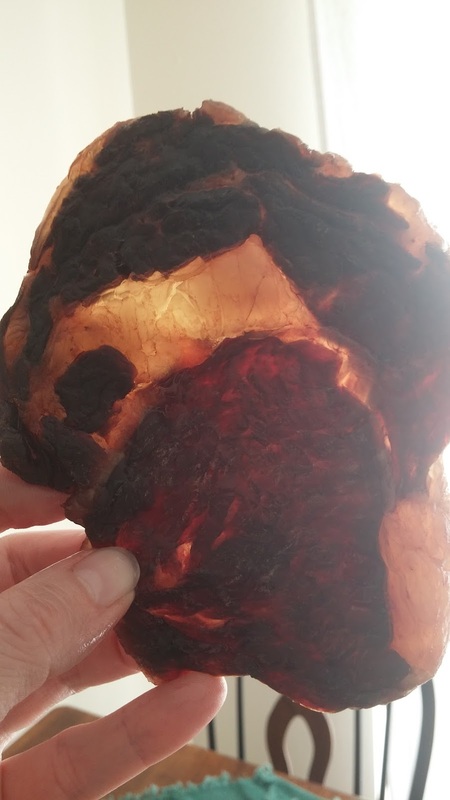 I still have bags of unprocessed meat in the freezer, so now I am thinking of making more jerky or maybe a form of pemmican out of some of it. Very mild flavor. The deer was young, so not gamy at all. We love deer jerky here too! Hoping this year my son and husband go hunting for deer and elk.